Who wants to help me learn how to install my suspension setup?!? 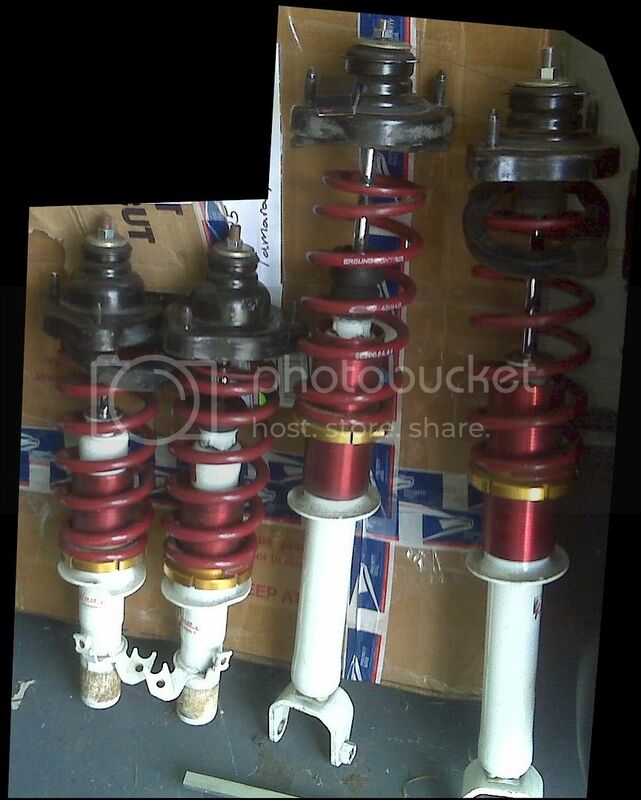 I've got a used set of Tokico Shocks Struts and Ground Control Coilovers. I've got VERY basic knowledge of how this stuff installs. I've looked over the spring installation guide on North Texas Prelude Owners, and thats basically the extent of my knowledge. The pic below is what I'm working with. I have a few questions to start with before I start tackling the job but I'm going to keep asking questions here as I go as a resource for the ultimate noob in the future. 1. The springs dont seem to be like attached to the struts in anyway. Shouldn't they be? And if so, how do they do so? 2. Where does using a spring compressor come into play with installing these? Do I really need to use one to take apart the old setup since i'm going to be replacing the struts along with the spring setup? 3. The person I bought them off of told me it was just going to be a plug and play setup, but I have a feeling that theres more to it than that. Any tips and tricks that anyone can offer me as I start this? 4. I didn't get any kind of wrench to adjust the height of the car. If I'm not mistaken its a matter of turning the gold rings to do so. With coil overs it wiill be necessary to jack up each side of the car individually to adjust them is this correct? As far as the wrench is concerned, is there something specific that I should be using? 5. Finally, other than the spring compressor is there any other special tools that I may need other than your basic stuff. If so, can any of the more expensive items generally be rented vs. purchased? Thats it for now, Thanks for all constructive help fellahs. oh and PS: If anyone could link me to any DIYs even if not prelude specific that I can use as a reference to learn off of I'd apprecaite it! Re: Who wants to help me learn how to install my suspension setup?!? I have the EXACT same questions/situation. I have some illuminas and I just bought some ground control coilovers (should be here friday). IF no one decides to help out, ill be sure to take pictures and make a full DIY on changing. is about all the knowledge I have. I figured I'd give you that if it helps at all..
pz.com hosts a number of great guys who are willing to help. I'm sure someone will chime in by this weekend. You WILL need spring compressors....if you like how your face looks and just life in general. The spring compressors compress the spring (obviously) and relieve the pressure from the strut mount so it can be removed. If you do not relieve the pressure you can bet that the strut mount and nut will come at you at a high rate of speed and it will not be pretty. As far as other tools are concerned, i have no knowledge of how that type of adjustable coil over works, but im sure someone will chime in to help you soon. I KNOW FOR A FACT THAT IF YOU AND FRIEND EACH GRAB AN END AND PULL REALLY HARD YOU'LL BE ABLE TO PULL THEM OFF. AND THEN WHEN READY TO REINSTALL THE NEW ONES ALL YOU HAVE TO DO IS RUN REALLY FAST INTO A WALL AND JUST HOLD THE SPRINGS ONCE COMPRESSED! yeaaa i dont think i'll be tryin that one bill. Last edited by intocarss; 08-26-2008 at 11:52 PM. well i dont really need to disassemble the struts do i? I'm adding what you see in the picture, do I really need anything from the stock setup? Last edited by intocarss; 08-27-2008 at 02:17 AM. but i will still need the spring compressor to install the new set right? If there preassembeld just remove you old ones and put in the new ones, you will need to jack the car up for coil overs to relife presser on the bottom mount. no spring compressor is needed for coil overs, when you drop the car the spring should set in right, check to make sure. Make sure you have a low proflie jack and a 3' pipe to break some bolts lose. Its simple and is about a 4 hr job for a new person. coilovers. you don't need the spring compressor since your taking the strut assembly apart. what constitutes as pre assembled? the springs are on the shocks as shown above. but the springs are loose they're not held on tightly onto the shocks in anyway that i can see. I'm just having trouble figuring out how the coilovers/springs are attached to the struts and whether or not there is anything more that I need to do with it. your coilovers are already all assembled, you don't need the spring compressor to do anything. you literally take the stock assembly off the car exactly how you pictured in teh first post; springs, shocks, spring hat, upper nut, etc etc. once you install the coilovers and lower the car back down, the springs will seat properly onto the shocks; you just gotta pay attention to that when you lower the car so they sit up in the spring perch properly. kinda? lol i guess this is just ognna be a hands on thing, I'm just afraid of starting and getting stuck with no help to figure the **** out. but I kinda get what youre saying. and once again since i'm not removing the oem springs from the oem struts I dont need a sprign compressor. makes sense now that i understand you dont need to compress the new ones to put them in. sounds simple enough. I gotta go buy a torque wrench. Anyone know what specs to torque everything to? download the online manual in the 4G resource thread; it gives the tq specs on every single nut and bolt on the entire car. its a VERY VERY VERY handy thing to have when working on the car!!! 3 12/14mm nuts holding the spring perch to the top of the shock tower. 2 10mm bolts holding the brake line on the shock. 1 12/14mm bolt holding the strut to the strut fork. 1 17mm bolt holding the strut fork to the LCA. take the spring assembly out, replace it with the coilovers. once you start working on the car, you'll see exactly what i'm talking about. the rears are a lil bit easier, cuz theres only 2 nuts on the top of the shock tower, as well as there is no shock fork. the shock bolts directly onto the LCA. I didn't even think of looking in it for the torque specs. so I'll def do that. Thanks again for all ur help, made it pretty simple. just don't use blocks of wood as jack-stands. someone's gotta tell me the story i've heard you guys mention it a few times. what fun would life be w/o messing up every now and tehn??? friggin sweet thanks for the link! so he used wood blocks for stands ??? Last edited by starbai; 08-30-2008 at 05:35 PM.